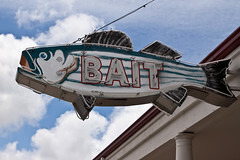 Bait by Laura Gilmore on Flickr. Used under Creative Commons license. There are tons of reasons to blog about your ancestors. You want to remember them, sort out a research problem, share a cool find. But let’s be honest. We all hope that our post will lead us to finding new cousins. It’s what’s known as cousin bait. Unlike the kind that you get at the local bait shop, cousin bait is a way to attract others who are researching the same lines. It’s all about getting names and information out there so that you can make those all-important cousin connections. I’m a big proponent in collaborating in genealogy. The more people working on the same research, the better off everyone is. You never know when that cousin who finds you is the one who has the family Bible or the treasure trove of photos. Within a couple of hours of the Week 1 recap being published, two participants in the 52 Ancestors challenge found a connection with each other. Beverly Harrison at The Hopeless Hooked Genealogist saw the link to Schalene Dagutis’s article “#1 Nathaniel Tucker, Poet.” Turns out that Beverly is a descendent of this Tucker line (from one of Nathaniel’s ancestors, rather than Nathaniel himself). Schalene has more details of this connection on her blog. Bill West’s post on Edward Colbourne netted him a new 8th cousin, once removed. Gary Scott of the “Looking Through the Lens of a Millennial Genealogist” Facebook page spotted Bill’s post and made the connection. My other connection wasn’t a cousin, but more of an “it’s a small world” thing. I knew that my friend Shelley Ballenger Bishop of A Sense of Family is from my old stomping grounds of the east side of Columbus and that her family had Reeb’s Restaurant at the corner of Livingston Avenue and Champion Avenue. It wasn’t until I read her 52 Ancestors post “Lloyd Ballenger and Reeb’s Restaurant” that I asked my dad if he remembered any of the Ballengers. Turns out he knows Shelley’s dad Ed and remembers her grandpa Lloyd. Small world. Dad and one of his numerous northern pikes. You know it’s a good size catch when it’s bigger than one of your children. Congratulations on finding a 6th cousin once removed! 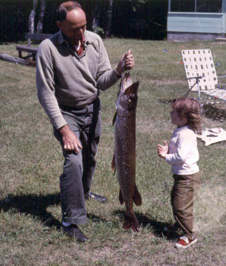 I loved Shelley’s post about Reeb’s Restaurant and her grandfather. Can’t believe your Dad knew them too. It REALLY is a small world. Thanks for this post. It’s great reading about all the connections being made. Roll on Week #2! We’ll have to put our heads together on the Debolt ancestry a little more – I have ADD (Ancestor Distraction Disorder) and find myself jumping around from family line to family line. When I was in ProGen I worked on the Debolt line from Daniel forward, but was quickly diverted to something else before doing much original research on his family of origin. Ancestor Distraction Disorder — I am so stealing that line! As for having fun — genealogy is supposed to be fun! WOW! After all this time, finally a diagnosis of my syndrome – “Ancestor Distraction Disorder” !! That so fits and I too am so going to steal it. Thanks! Wow, a double cousin connection!! Jodi, who were the parents of Michael Debolt (husband of Abalona Yeager)? I’m not sure, I’ve not done much research on them as yet, but Michael (husband of Abalona) had approximate birth-death dates of 1774-1859. Nothing in the DeBolt line but a distant cousin did contact me. I was aware of him but had never contacted him. We’ll be sharing a lot of info about our respective lines. I can’t wait to hear what your Dad remembers about Reeb’s and my dad and grandpa, Amy! Now that my dad’s health is declining, I’m trying to gather stories from people who remember the restaurant, so I’m thrilled to make this connection. It really is a small world. And Karen–you hit the nail on the head with Ancestor Distraction Disorder. I get it all the time! 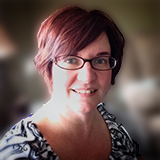 Amy, I love your idea for the 52 Ancestors Challenge! I’m coming in late, but would like to jump in here and participate. I read your recap and found many great posts that gave me ideas, even if the surnames don’t match mine. So….I’ve written my 1st post and will be doing a 2nd one in a couple of days, just so I’m up with everyone else, at least at this point. Thanks so much for inspiring us. Joining your 52 ancestors challenge & excited to do so. Great idea & looking forward to reading others blogs as well. Welcome! One thing you might want to think about… including the name of your ancestor will make it much more likely for cousins to find you. Not only through this challenge, but through people doing Google searches. Just a thought — it’s completely up to you! Also jumping in on this project a week late. My week 2 post is up over at LiveJournal! Thanks for starting this!